New Delhi, October 2014: In true tradition of excellence, Rajnigandha has come out with a special Festival Pack for connoisseurs of mouth fresheners this festival season. It’s a perfect festive season gift for your loved ones that they will relish for long. This exclusive festival pack comprises of three 100g packs of Rajnigandha Pan Masala and one trendy dispenser of Rajnigandha Silver Pearls Elaichi, available at a special price of Rs 700/- at your nearest outlets. 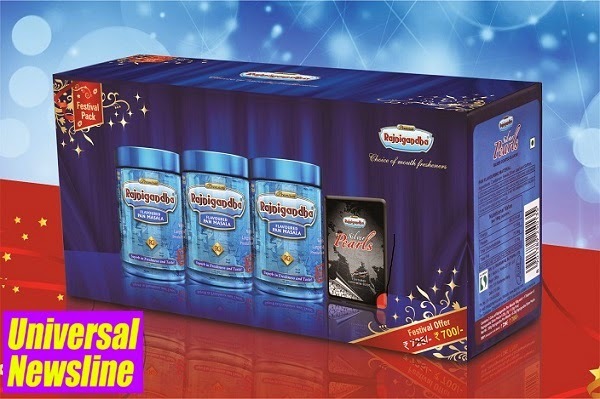 Rajnigandha Pan Masala has been known for its superb taste and admired by patrons of mouth fresheners for decades. Recently, the brand extended its product offering with launch of Rajnigandha Silver Pearls, the saffron blended, silver coated cardamom seeds, which is the modern avatar of ‘Elaichi’ for the dynamic generation.